This week there is a new Target app coupon valid 9/2 – 9/8: receive a $15.00 Target gift card with a $75.00 Baby Department purchase. Clip the coupon from the Target weekly ad or find it in the “wallet” section of the Target app. This offer is also valid on target.com, no promo code required. 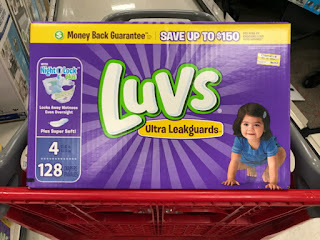 Take a look out for Luvs Value Pack Diaper Boxes to be on clearance for $15.74 at your local Target store! Combine the mobile coupon with manufacturer coupons to save both on Luvs and Up & Up diapers. This is just one deal idea; you can mix and match with other items. Be sure to scan the Target mobile coupon first, before any manufacturer coupons. Or if you prefer to buy just one box of diapers? Pay $13.74.